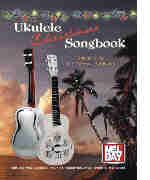 This uke chord DVD makes it possible to learn all the essential chords. Learning becomes much more interesting when you can see and hear each chord. Joe Carr teaches the chord shapes and positions that are used by all leading professionals. Watching Joe's hand positions and listening to each note in the chord will improve your ear and enable you to learn at a faster pace. Fun with the Ukulele is an excellent beginner's dvd featuring Joe Carr teaching simple chords, strums, and songs. An ideal beginner's course for ukulele in C tuning.